GAME RULES: ONE BALL IN WINS! Before you eat pizza or pasta at the surfer-themed Pizza Oom Mow Mow restaurant, you should build up your appetite at the beach—Reboundo Beach, to be precise. Its on the right as you approach the restaurant. Sorry, surfers. 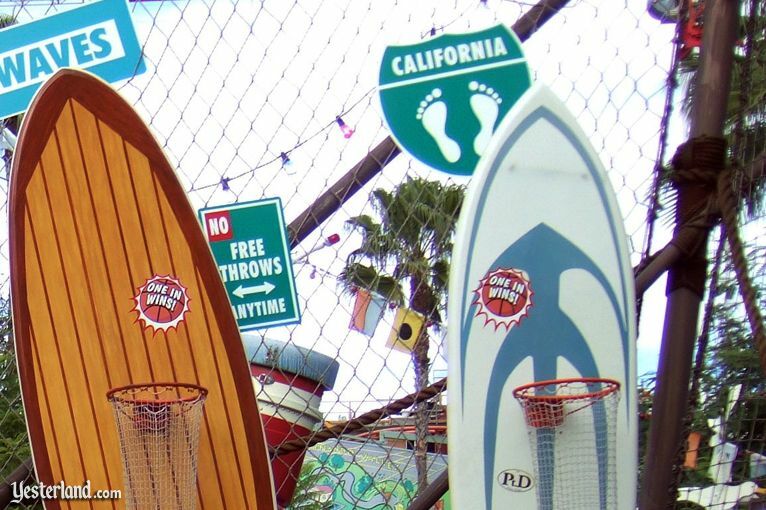 You cant shoot the curl at Reboundo Beach, but you can shoot hoops. Give it a try. This is a game of skill. You do have the skill, dont you? Give the nice lady two dollars. You aim. You shoot. Oops. Now that youve had a chance to get a feel for the game, the second try should be a cinch. Hand over another two dollars. You aim. You shoot. Oops again. Third times the charm, right? Pull two more singles out of your wallet. You aim. You shoot. Score! Dont you wish you had taken the three tries for five dollars option? 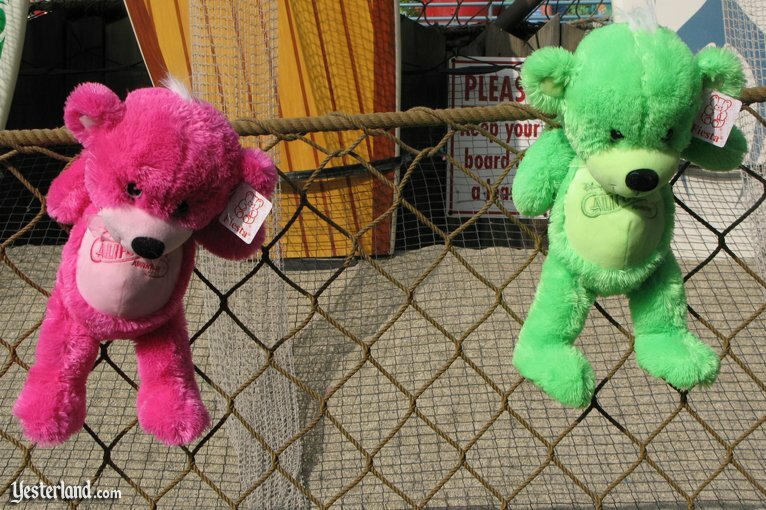 Its time to pick a prize. The pig and the cow are hanging their heads in shame. It seems that nobody wants them. You cant go wrong with a plush bear, especially one with the California Adventure logo emblazoned on his front like a chest tattoo. Pink or green? Pick carefully. You paid six dollars for this little Fiesta Toy bear. Night is a magical time at Yester California Adventure. Would you like to play Reboundo Beach again? Maybe you could win a friend for your little bear. Sorry. Reboundo Beach is closed for the evening. The lights are on, but nobodys running the game. The prizes have been locked away for the night. Spend your money on pizza instead. It might not be the best pizza in the world, but you wont have to worry about what to do with the prizes when you get home. 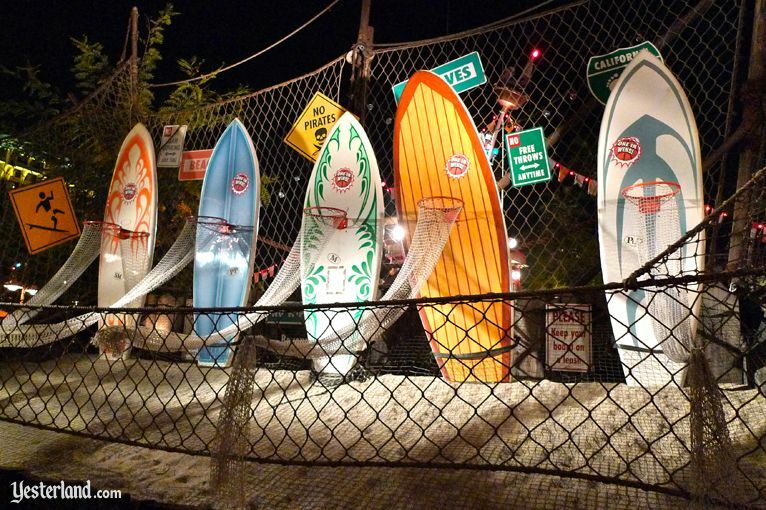 Reboundo Beach opened on February 8, 2001, as one of the original features of Disneys California Adventure. 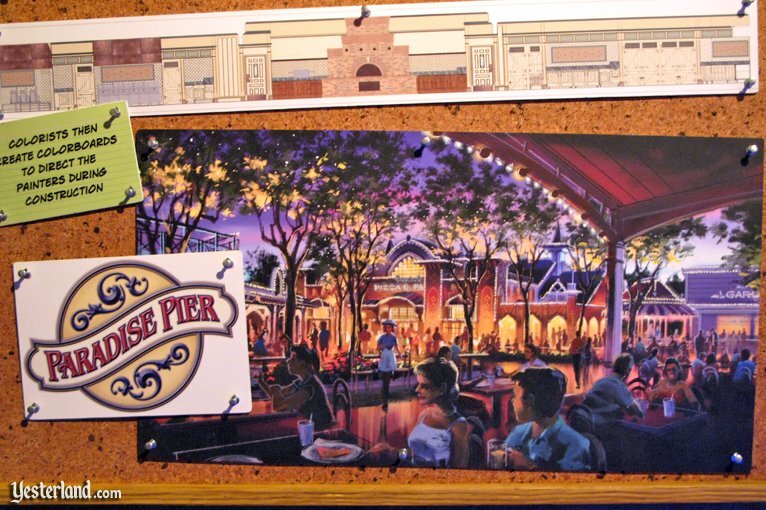 The new park also offered seven other carnival games at Games of the Boardwalk in a different part of Paradise Pier. Those seven games are also gone, replaced by part of Toy Story Midway Mania! (June 2008) and four Disney-themed games at the new Games of the Boardwalk (April 2009). Traditionally, Disney theme parks did not have “throw something and win a prize” games as permanent attractions. California Adventure was the first, but not the last. Fossil Fun Games (March 2002), five games that one might find at a roadside carnival, are part of Chester & Hesters Dino-Rama! within DinoLand U.S.A. at Disneys Animal Kingdom. 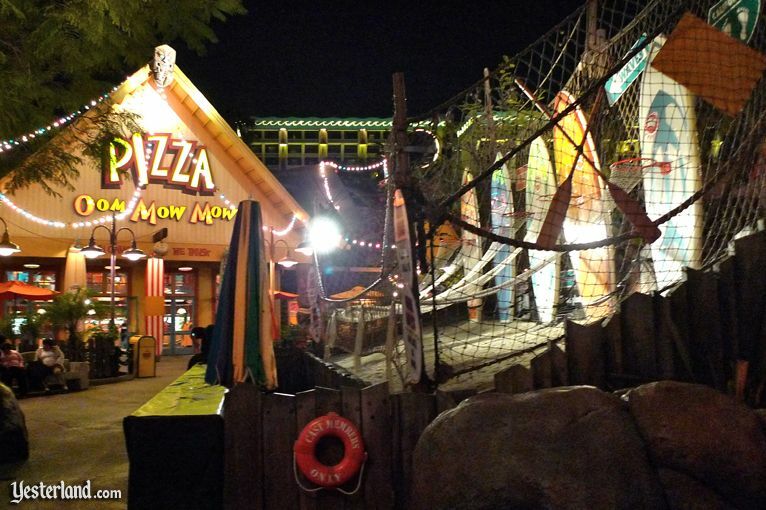 Reboundo Beach lasted until September 6, 2010, when it was removed to allow construction of expanded outdoor seating for Boardwalk Pizza & Pasta (former Pizza Oom Mow Mow) and Paradise Garden Grill (former Burger Invasion). Including Reboundo Beach, Disneys California Adventure originally had a total of eight games of skill. Now there are half that many. Photo of Reboundo Beach hoops: 2007 by Allen Huffman. 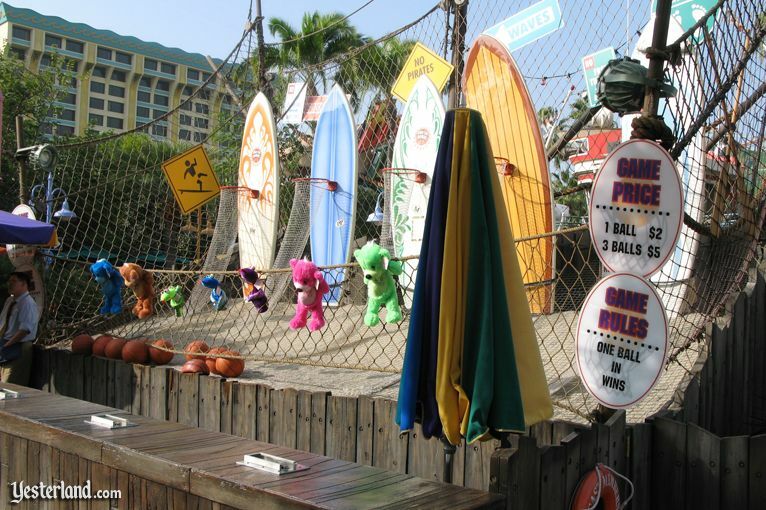 Photo of Reboundo Beach carnival game with prices: 2007 by Werner Weiss. Photo of Reboundo Beach by day: 2007 by Allen Huffman. 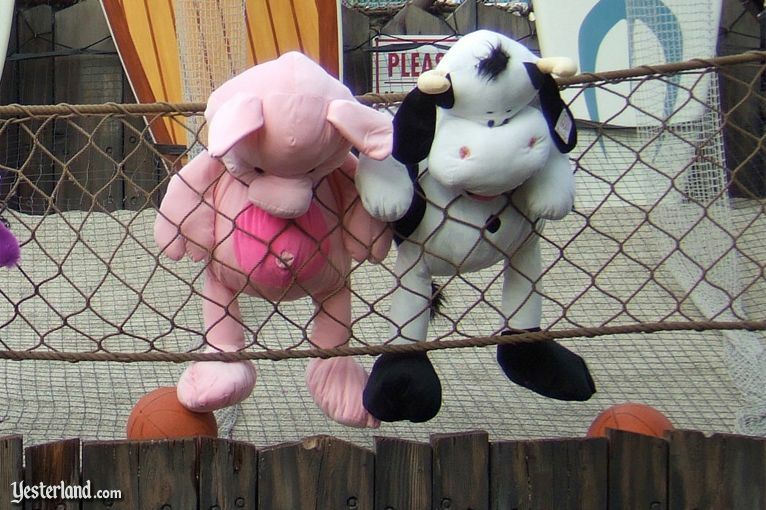 Photo of Reboundo Beach pig and cow prizes: 2007 by Allen Huffman. 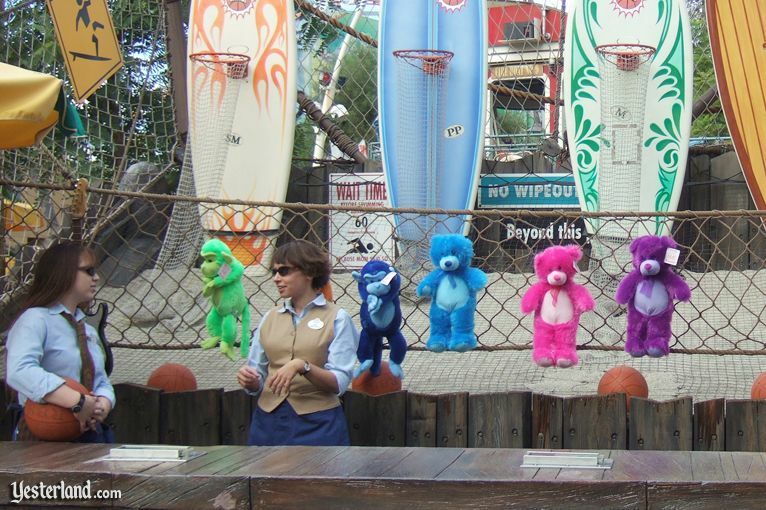 Photo of Reboundo Beach bears: 2007 by Werner Weiss. Photo of Reboundo Beach at night: 2009 by Allen Huffman. Photo of Reboundo Beach at night with Pizza Oom Mow Mow: 2009 by Allen Huffman. Photo of artwork in Blue Sky Cellar: 2010 by Werner Weiss.